Does the Family You Work for Have a Dog? Pet-sitting can be a pet-peeve (no pun intended) for some nannies and au pairs. Using a simple pet-sitting contract can be helpful when parents ask nannies or au pairs to pet-sit. For example, if the family will be traveling on vacation the nanny or au pair should create a separate pet-sitting work agreement that includes essential responsibilities for the job. If the au pair or nanny cannot perform the pet-sitting duties the parents can then use the work agreement when they hire another pet-sitter as well. Emergency phone number where the family can be reached in case of emergency. Pet-sitter back up person in case of emergency. List of family, friends, or neighbors that have a key to the house. Detailed history of each pet. 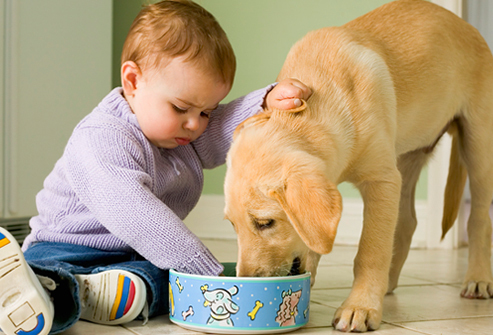 Where family buys pet food and supplies. What food to serve each pet, at what time, and the amount of food. Detailed list of any medications required. When, how much, and what type of medicine should be given to each pet. Which treats the pets are allowed to have and at what times. Fees per walk and length of each walk (for example half hour walk). Does the family you work for have a dog? Have you experienced any issues working with pets? Victoria:yes. a golden doodle who wants lots of attention from the nannySamantha: One of my previous families decided to get a golden retriever puppy unfortunaly i ended up having to care for him, a 1 yr old and a 3 yr old with no extra pay! i wasnt very happy! No pets in my current family and they dont want to get any either! !Lois:No but my boss lets me bring my puppy to work so her little boy gets used to being around animals 🙂 Suzanne:Yes, 11 yr old black lab 🙂 Stacie: yes an older black lab bassett hound mix.I've worked for several families with dogs, I love it. Lisa: I have never been a fan of dogs, cats on the other hand I love. While there are many cons to current pet dog I can says she growls and barks at everything so the kids can be in the backyard and I know she is guarding.Kari:One of the families I work for has a dog. They know I am not a fan of dogs… The children are responsible for letting him out/feeding him. I generally won't work for families with pets. Christine:Yes they have a turtle that we found at the park and they love her. Sarah:First nanny family had a German Shepard named Blue and I loved that dog. The only thing I had to do was open the door for him to go out which was not a big deal at all. Current family has 2 cats and I don't do anything for them. Although I did volunteer to take care of their litter boxes if DB diesn't get to do it before her leaves for work but this is only because MB is pregnant. Victoria: In my area, nannies are paid extra for pet care. Not so at my job for a few reasons. Youngest (12 yr old) is in charge of the dog but he'd much rather be gaming online so often I end up caring for her. Penny:I'll have you know that I have 4 furry charges who believe I'm their nanny & not there for the children. Puppy pouts when I have to leave! Jody: Uggghhhh….yes! they have cats, I'm allergic. I don't have to do anything for them, and can't touch them (even though I love cats) but since they seem to be in a puking stage I feel too bad to leave it for mom and dad to get home. I am NOT a dog fan, but almost every family I have worked for has one. I always tell mom and dad that I am ok with the dogs, but since I am not a dog person I won't be playing with their dogs. The new family I am working for 2 mornings a week has an older small dog that doesn't bother me at all, and a bigger and louder dog that they either keep upstairs while I'm there or take to doggie daycare.